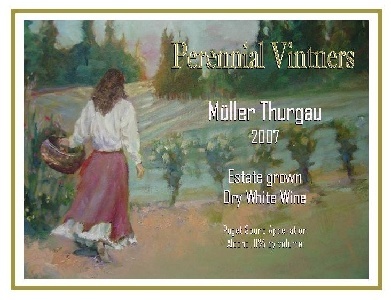 This is our third release of our Estate Müller Thurgau, vintage 2007! [Retail price was $16.00]. It will soon be available at local fine wine shops and at restaurants on Bainbridge and in Seattle (see Where to Find page for locations). Our family hand maintains a half acre block of vines originally planted in 1981 by our neighbors at Bainbridge Island Vineyard & Winery. From this block we've harvested 1+ tons of grapes, yielding 60 cases of wine. Although 2007 was a difficult growing year in the Puget Sound area, we brought in the 2007 harvest with good numbers and clean bright flavors. It is a dry white wine, and is an excellent accompaniment to most fish and other seafoods; it especially shines with Mike's specialty Dill-Caper Chicken. This wine was not intended to be aged -- please enjoy it young, while its fresh fruit aromatics are at their peak. 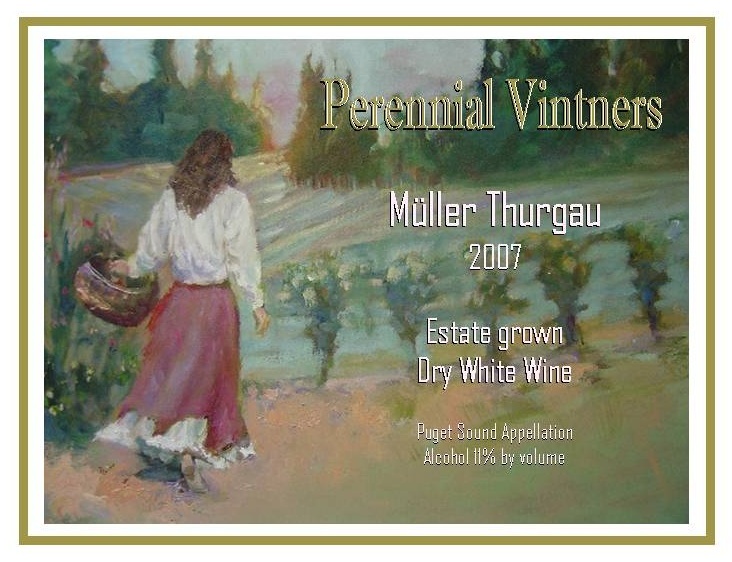 Note 20100525: was too busy to mention last Fall, just remembered now... We got a bronze medal for this wine at the Evergreen State Fair Western WA Wine Competition in 2009. See HeraldNet.com: Rainy Side Winners.